The CRE week is a specific week where the Geraldton community and local businesses and organisations will host events and activities that promote a community free of family violence. CRE week will run from 1 April to 5 April 2019 and participating businesses and organisations will offer a range of activities throughout the City of Greater Geraldton that raise awareness of family violence and encourages with people to say that #ViolenceIsNEVEROk in the community. Family violence is a significant social issue in our community which is preventable and can be effectively reduced by education activities and community action. A reference group made up of family violence prevention leaders has been instrumental in committing to actions proposed in a local strategic plan for family violence prevention, including the CRE week. They have worked collaboratively to develop this inaugural CRE week in 2019 with plans for it to become an annual event. 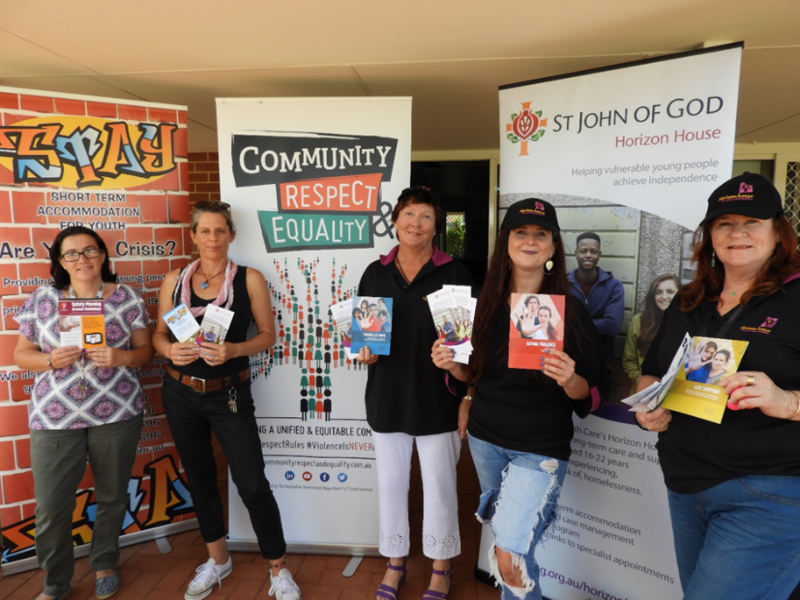 Jo Peet, Support Co-ordinator from Horizon House Geraldton, and Amanda Brunelli from Short Term Accommodation for Youth (STAY) will combine to do a family violence information stall on Tuesday 2April in the foyer of the St John of God Hospital. They will wear white shirts for the day and be asking people to join them to create positive notes and affirmations at their table around the #ViolenceIsNEVEROk and #RespectRules themes. “As a youth organisation we like to promote healthy relationships, starting from a young age, as well as encouraging them to grow in the relationships they already have with others,” said Ms. Peet. Organisations and businesses can still be involved by holding an event or activity during CRE week. Event suggestions include an informational morning tea, putting a display in your workplace waiting or staff room, running a sports event promoting respect and equality, inviting a guest speaker to your workplace or running a poster competition. Any idea that links into the #ViolenceIsNEVEROk, #RespectRules or promotes a respectful and violence free community is encouraged. The CRE Week was developed by the CRE Reference Group and promotion of the week has been supported by a Bendigo Bank community grant.